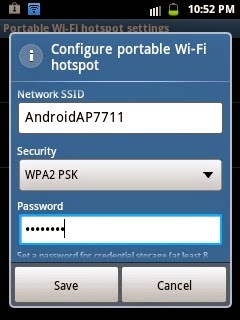 Home / Android Tricks / ඔයාගේ anroid දුරකථනයත් Wifi රවුටරයක් කරමුද? 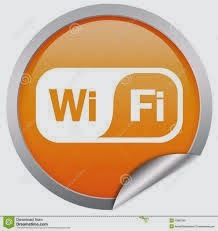 ඔයාගේ anroid දුරකථනයත් Wifi රවුටරයක් කරමුද? ඔන්න යාලුවනේ මන් අද කියාදෙන්න යන්නේ ඔයාගේ ෆෝන් එක Wifi රවුටරයක් විදිහට පාවිච්චි කරන්න හදා ගන්නේ කොහොමද කියලා. මුලින්ම ඔයාලගේ ෆෝන් එකේ setting වලට යන්න. ඊට පස්සේ Wireless and networks කියන එකට යන්න. ඊළගට Tithering and portable hots කියන එක click කරන්න. ඊළගට portable wifi hotspot කියන එක click කරන්න. 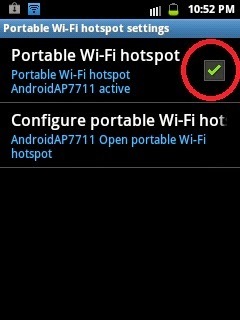 ඊළගට Configure portable Wi-Fi hots කියන එක click කරන්න.ඊළගට පහල රූපේ තියෙනෝ වගේ එකක් එයි. ඔයලට කැමති password එකක් දාන්න.password කියන උඩ තියෙනෝ නේද security කියලා එකක්.එකේ WPA2 PSK කියලා එකක්.ඒක නැතුව OPEN කියන එක දුන්නොත් PASSWORD එකක් NAඑහුව ඔයාගේ ෆෝන් එකෙන් අනිත් කෙනාට INTERNET යන්න පුලුවන්.කොහොම password එකක් දාන එක හොදයි නේද යාලුවනේ.ඊට පස්සේ save කරල වෙන ෆෝන් එකකින් හරි ලැප් එකකින් හරි scan කරල බලන්න ඔයාගේ ෆෝන් එක පෙන්නනෝ නේද කියලා. Thank you. This is very useful. I appreciate your help.